Ellen DeGeneres hand-delivered the tip -- some of it out of Pharrell's big hat -- during a post-pizza-delivery recap on Monday's "The Ellen Show"
The delivery man who ushered a stack of pizzas into the Oscars on Sunday night didn't leave the star-studded room without becoming one of the most buzzed-about folks to grace the Hollywood show -- and he pocketed a hefty tip to boot. His reward came Monday when Oscars host Ellen DeGeneres hand-delivered the tip -- some of it out of Pharrell's famously large hat -- during a post-pizza-delivery recap on "The Ellen Show." The pizza man's cameo kicked off when DeGeneres decided to order pizzas to be delivered to the Dolby Theatre in Los Angeles during the 86th Academy Awards, and family-owned Big Mama's and Papa's Pizzeria lucked out as the chosen restaurant. Then, apparently out of nowhere, a red hat- and apron-wearing man holding a stack of pizza boxes was serving cheesy slices to Hollywood A-listers. Brad Pitt, Kevin Spacey, Jared Leto, Julia Roberts, Meryl Streep and more could be seen reaching for a slice of the pie and chowing down -- clearly unconcerned with possible spillage on their Sunday best. After some questioned whether the delivery man, Edgar Martirosyan, were hired to appear on television, the restaurant tweeted Martirosyan was just an employee at work. "#BMPP Delivery Driver Edgar Martirosyan. He is not an actor, just doing his job. 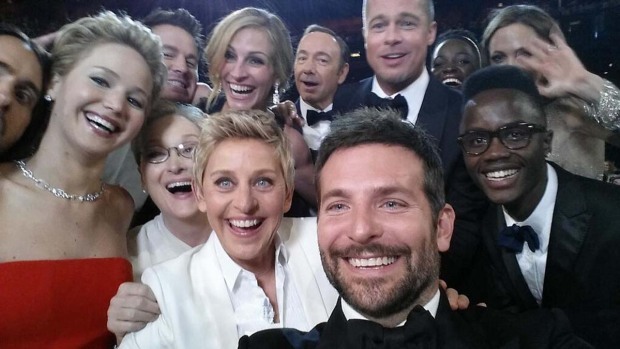 #Oscars @TheEllenShow," @BigMamasNPapas tweeted. "Edgar, former driver bought Hollywood franchise location 5 yrs ago. Store was busy he delivered & ended up on #Oscars," another tweet read. The pizza chain already touts a Guinness World Record for the largest pizza commercially available, with a pie that measures at a whopping 4 feet by 6 inches. Martirosyan joined the Oscars host on "The Ellen Show" for a post-pizza delivery recap on Monday. Recalling the night of the show, Martirosyan said he thought he was going to deliver to some writers, and upon arrival was greeted by DeGeneres. "I'm going in and I'm on a stage. I was shocked," Martirosyan said. "It was really crazy." DeGeneres made sure Martirosyan didn't leave empty-handed. "You left before I gave you a tip, and I passed Pharrell's hat around and I ended up getting about $600," she said as she took a wad of cash out of the brown bucket hat. Then she reached into her pocket and handed him even more money -- bringing his tip total to $1,000. And the hefty tip isn't all Martirosyan got out of the deal -- he also met the "woman in his dreams," Julia Roberts. "I was always watching her in movies back in Moscow, 'Pretty Woman,'" he said. "It was just crazy to me to deliver for her."